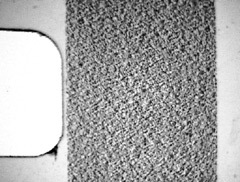 Analog sound can be stored on film in 2 different ways: optical and magnetic. Although a magnetic soundtrack sounds much better, it is also much more expensive and more sensitive to dust, scratches and wear. Magnetic soundheads are also way more sensitive to wear, since direct contact with the magnetic strip is needed. Therefore, magnetic sound is not found anymore on both 35mm and 70mm. 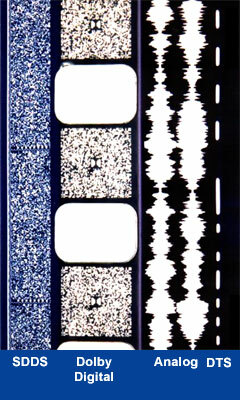 Many optical sound-on-film have been developed over the years. The only one that survived is the stereo variable area (SVA), developed by Eastman Kodak, RCA and Dolby in the early 1970s. Before 1970, it was not possible to have stereo optical sound due to noise problems. With the Dolby A noise reduction system and later Dolby SR (Spectral Recording) it became possible to have stereo optical sound on a standard 35mm print. 70mm film included up to 6 (magnetic) discrete audio channels on the same film along with the picture. Since 70mm film was (and still is) way more expensive than 35mm film, a multi-channel format for 35mm was needed. Since 35mm film has little room to include more than 2 soundtracks, this posed to be a real problem. Many multi-channel 35mm formats were developed, such as a system that used a seperate magnetic tape running in sync with the picture to store the audio channels. Obviously, this was not a very practical system. Dolby developed a method in 1976 to use the 'standard' stereo optical soundtrack to encode 4 analog channels. Both the center channel and the surround channel are encoded into the front left and right channel using certain analog encoding techniques. Since it is not a true 4-channel system, the seperation between the channels is very poor, although some improvements have been made over time. Dolby Digital was launched in is by far the most common digital sound format, both in the cinema as at home. It encodes 5 channels (left, right, left surround, right surround and center) and one LFE (Low Frequency Effect) channel. That's why it is moste times called Dolby Digital 5.1. The format uses a psycho-acoustic spectral compression technique to achive high compression ratios. This is also the main drawback of Dolby Digital: it is the worst sounding digital cinema sound format. In the cinema, the data is digitally stored on the 35mm print between the sprocket holes. No 70mm format exists. It uses a special CCD soundhead to read this data from the print. This soundhead also reads the old analog soundtrack. If the reader fails to read the digital sound, the analog soundtrack is used as a backup. The read data is processed by a special dolby processor and finally amplified. Digtal Theater Sound uses another approach to store the digital data. The data itself is stored on 3 seperate Compact Discs. On the print, only a timecode is stored to synchronize the picture and the sound. This makes it possible to use much higher datarates (and thereby higher sound quality) and it makes the format fit on almost all existing film formats. SDDS is not commonly used in cinemas. It encodes 7 channels (left, center left, center, center right, right, left surround, right surround) and one LFE channel. As with Dolby Digital, the data is directly stored on the print. Since a higher datarate is used, there are SDDS soundtracks on both edges of a print. This makes the system somewhat fragile. It is also the only system which is exclusively used in cinemas. There is not a home variant of the SDDS system. Dolby Digital EX is an extension of the Dolby Digital format with one additional channel: center surround. Especially in smaller cinemas and home cinemas there is a big gap between left surround and right surround. This channel is used to fill this gap. The good-old matrix encoding technique is used to encode the extra channel in the two existing surround channels. DTS ES is the DTS version of Dolby Digital EX and also adds one extra surround channel. Cinema Digital Sound was the first digital cinema sound system. It encoded 5.1 channels of discrete audio on both 70mm and 35mm film prints. The system was set up in the typical Left, Center, Right, Right Surround, Left Surround, LFE channel format. CDS encoded 16-bit PCM audio in a compression process called Delta Modulation. The compression level of this compression process was approximately 4:1. The system sounded very good. Some sound designers have argued CDS sounded better than any of the current formats. The CDS digital data replaced the magnetic tracks on 70mm prints and the SVA (analog) tracks on 35mm prints. Of course, this meant CDS had no audio backup in case the digital system failed. It also meant theater operators had to carry dual inventory prints in case of a hardware component failure or seriously degraded soundtrack. Failures did happen. The LED and CCD video technology was not at the level it is today for imaging more than 1 million printed spots per second. Film printing technology was also a good bit more primitive in 1990. The fatal flaw in CDS was the lack of an analog backup soundtrack. Sadly, only a few films were released with CDS digital sound. CDS was the first to encode digital sound on a 70mm release print. CDS was the first to put digital sound on 35mm with "The Doors", released March 1, 1991. "Hudson Hawk" was the first film to put six track audio into theaters without any 70mm release prints. "Terminator 2" was CDS's brightest moment, but after that everything fell apart. "Final Approach" was the last actual CDS release. "For the Boys" and "Universal Soldier" were both announced as CDS releases, but CDS prints never made it into the theaters. A typical CDS soundtrack is shown on the right. Note the very fine bits when compared to a Dolby Digital and even a SDDS soundtrack. This makes a correct readout prone to dust/scratches/wear, lab errors and reader misalignment. If you also take into account that CCD technology was not as advanced as it is today, you might guess this will give trouble.